Activision's attempts to move Guitar Hero beyond rock and into the vast numbspace of pop has reached out to the DS Lite as well, bringing us the game Band Hero. Note that I specifically referred to the DS Lite because you can't play the game on the DSi or older DS models. The DSi lacks a Gameboy port and thus can not be used with the guitar grip peripheral, and the drum pad wrap is form fitted to the DS Lite and not its bulkier ancestors. Since I've already mentioned the game's peripherals, I might as well start there. The guitar grip is the same as that that came with the DS Guitar Hero games. It features four fret buttons and plugs into the Gameboy cartridge port. As notes come down the track on the upper screen you hold down the correspondingly colored fret button(s) and use a pick-style stylus to strum the strings on the DS' lower screen. It's a clever way to try and capture some of the experience of playing with plastic guitars on a home console, but unfortunately it's also a great way to induce crippling joint pain. About the only way to hold the game is with your forearm on a flat surface and your wrist as straight as possible. even then there's usually a two song limit before the searing pain kicks in. The controller is a giant leap backwards in ergonomics and there's just no way to play the guitar parts in the game without torturing yourself. Band Hero marks the debut of a portable drum controller, but using both the word 'drum' and the word 'controller' is stretching things. The drums consist of four colored buttons set in a silicone sleeve that wraps around the bottom half of the DS clamshell. The pads sit across the up and left buttons on the D-pad and the A and B buttons on the other side of the screen. As the notes scroll down the top screen you press the correspondingly colored drum buttons. On the lower skill levels it feels more like button-matching gameplay than it does playing the drums, and on the higher levels it feels like furious button-mashing far more than if feels like you're playing fills and riffs. I'm not sure why they went with the silicone glove for the drums - which, by the way, makes it impossible to close your DS - when a far better solution would have been to include two stylus drumsticks with the game and put the drums on the touch screen. 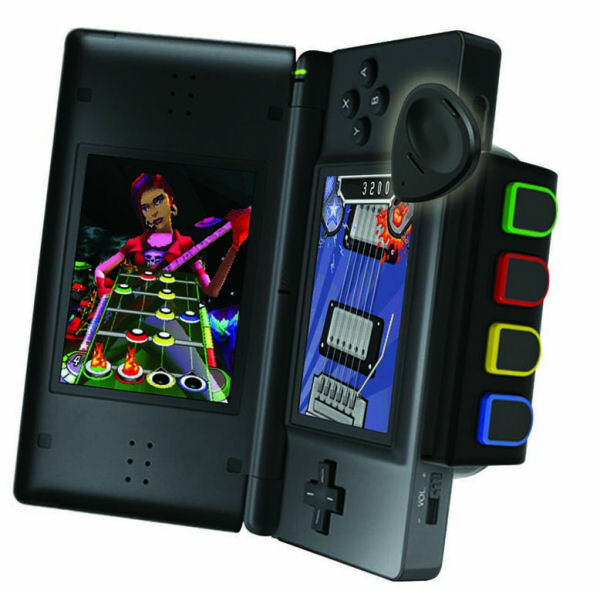 Sure you would have to put the DS on a flat surface to play, but you pretty much have to do that with the guitar as it is anyway. It would certainly have made it feel more like you're actually playing the drums.